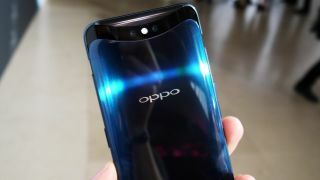 The Oppo Reno phone (or series of phones) is set to launch later in April, and we've started to see teases from Oppo and leaks from other sources as to what we can expect from the phone (or phones – more on that later). Now we've seen a patent for a camera that looks like it fits on one of the plus-sized models in the range. The patent, found by LetsGoDigital, just shows the rear camera setup of an Oppo device – it consists of four holes, one of which presumably is the flash so the other three must provide different lenses for the device. What do we know about the OnePlus 7 so far? Will the Samsung Galaxy Note 10 have a 5G counterpart? The typical three-camera smartphone usually has one powerful main sensor, joined by a camera with a wide-angle lens and another that specializes in telephoto, or some other depth-sensing tech. We don't know what the three cameras shown in the patent are, but they'll likely be similar to other phones. We'd previously seen an Oppo Reno render that showed only two rear cameras, not the three that we see in this patent, but the fact these reports contradict each other doesn't mean one or both of them are wrong – in fact, it points towards another rumor we'd heard. According to multiple sources, including the LetsGoDigital report on the patent, Oppo is planning to release not one but five Reno phones. These will be the 'Lite', 'Zoom', 'Youth', 'Plus' and 'Pro' models – we're expecting them to vary in power and speciality, much like the Moto G7 series, but we don't know too much about the phones. We predicted the two-camera render we saw was from the 'Lite' or 'Zoom' model, so this step up could perhaps be in the 'Youth' or 'Plus' phone, but we'll need to wait until the phones are released to be sure. Also launching alongside the five phones (or possibly as one of them, perhaps the 'Pro' model) is Oppo's 5G phone, another Oppo handset we don't know all that much about. We're waiting until April 24 for the Oppo Reno European launch event to find out more about the prospective five phones, and will be reporting live from the launch, so check back to TechRadar then for all the news on the quintet.